I still have a couple of quick questions that I don't have answers to. Now that more of you have done this mod, I am hoping that some can verify a problem that I am still having. 1. Can you successfully maintain a WiFi 802.11 AC connection with an Apple Airport? 2. Can you successfully maintain an AC connection with any other non Apple AC router? BTW, I can connect to N (and slower) routers fine. I can connect with both the iPhone 5 and 6 just fine. I cannot connect to my Apple Airport (a, b, g, n, ac) at any speed. There is nothing wrong with the Airport router. 2013 iMac and iPhone 6 connect via AC just fine. Thanks for any info you can provide! I'm glad that there seem to be a lot of people having success with the mod. 1. Yes. I have two 2013 Airport Extreme routers, that I can connect with out an issue. 2. I don't have the ability to try this, but it can connect to my iPad or iPhone and use their LTE connection. I'm not sure how to test your scenarios. I have Airport Express devices on my network and I have an Airport Time Capsule, too. None of those devices create or extend a network; they just connect to my AT&T U-verse router/wifi network; the Expresses by wifi and the Time Capsule by cat5 ethernet. (The Expresses are used for Airplay and the Time Capsule for Time Machine backup of iMac and Macbook Air.) If you can explain how to test your questions, I will be happy to do so and reply. Hi all, one issue that I'm having after this upgrade, is that my bluetooth mouse settings keep going back to default tracking speed. (I prefer to increase the tracking speed in the mouse settings.) I'm not sure if this is due to the upgrade, or Yosemite, or some other application I'm using. I haven't yet tried to decipher exactly when it happens - it happens often enough but not all the time. I just wonder if anyone else is experiencing this. Thanks. I have isolated that this happens when I remote into my iMac using VNC via a bonjour connection. No big deal, really, but this scenario didn't previously cause my mouse tracking speed to reset to default level. I finally got around to installing everything this weekend. Unfortunately my system currently does not recognize any wifi adapter. I am using the osxwifi.com adapter and bcm94360cd card. Worth mentioning that I did run D+, D-, VCC to the wifi board and I do have working bluetooth. I'm not sure what's wrong that my system does not see the airport element of the card. Does anyone know what could be going wrong in my setup? Alright, I received the new card from OSXWIFI and it's working now! Here are some photos of the process. This is a late 2009 iMac 27". It's been mentioned before that the power might not be required but I had trouble using the keyboard during boot (ie. boot options) without the added power line. It was easy enough to do so I did it anyway. Showing locations of original wifi and bluetooth boards. Showing pinout on the bluetooth cable. Your colors may cary but pinout is the same so go off of cable location rather than color. Showing new wifi/bluetooth card installed. D+, D- soldered for bluetooth data. Power line also soldered onto last pin on adapter board. I have the same 27" 2011. Can you list what parts you needed to order please. I followed Scobert72 (tread #48) in page 2 direction, but since I lived in Taiwan, I have to source my component here and in China to save shipping cost. 1. Apple/IMAC A1311 MID 2011 ANTENNA BLUETOOTH BOARD x2 (to take the bluetooth connector off from, exactly same as my old one). http://tw.taobao.com/item/37768692995.htm?spm=a1z3o.7406521.0.0.BmCCwm It costed me about $16 including shipping. Above three items I got from http://zyxtech.en.alibaba.com. It costed me US$42 including shipping. 5. PCB board SSOP/TSSOP/MSOP8P to DIP8P board/6 pieces. 6. 100g SMT use 183 degree solder paste. 7. Chip Quik SMD1 NL Removal Kit. I got it from http://www.pcstore.com.tw/ICshopping/M13834064.htm It costed me US$21. 8. 936C SMD temperature control solder. I got it from http://24h.pchome.com.tw/prod/DEAC00-A74709546 It cost me US$31. Of course, item 6 to 8 are optional. I spent US$110 in total. The parts itself are US$65 and the rest are solder related stuffs as I didn't have any solder tools. In addition, you will probably need 3 longer wires for your 27" iMac to connect between pic-e adaptor and bluetooth cable as the two wires provided by manufacture were just barely long enough for my 21.5" iMac. Unfortunately despite various attempts at antenna placement I ended up having no end of trouble with intermittent bluetooth lag and dropped connections. The wifi worked fine and occasionally handoff worked seamlessly but the lag and connection issues meant it was unuseable. Since reverted back to the original board and I have a stable bluetooth connection some distance away from the iMac. Shame really. My bluetooth actually improved since the modification, as I can practically use magic mouse 3 ft away. Initially there were some jittering movement with the mouse, but after turning on/off, the symptom gone away. I also used a separate bluetooth antenna (just like http://www.ebay.com/itm/191110158624?_trksid=p2060778.m2749.l2649&ssPageName=STRK:MEBIDX:IT&afsrc=1) as I can not find the male/female extension cable to reused the old one, and I taped it just below the old antenna receptor at. The cable was quite long even when I used the shorter one (white cable) so I had to tug the cable somewhere. It is too bad you had to revert back after all the troubles. Did you make sure you connect the bluetooth antenna correctly? I connected my at J3 (third one from the right). I have been reading this thread with interest, hoping at some point this will be feasible for me to try. I just read that the new activation tool is allowing usb dongles to work. While this still won't work on my 2011 21.5 iMac (due to using an athos card vs Broadcom), it gave me an idea. Would it be possible to install the new ac wifi card in the iMac, and use a Bluetooth 4.0 dongle now that there is some support? If it works, it would eliminate the soldering, running extra usb wires (might still need another antenna wire, not sure) and make the install easier. I want to know if you made any other EXTRA modification to the Mini PCI-E Adapter ver 3.0 in order to supply extra power to the new BT module. I can see that you soldered a wire to R1 in order to have power independently from Wifi module. I know that is extra wires ends in the old BT module connector, in the first pin. My question is that if you have cutted any trail in the adapter regarding to the previous way of powering the new BT module. No, just solder the 3.3V cable from old BT module connector to R1 spot and no trace was cut on the adaptor. It worked just fine. I can turn off wifi without affecting bluetooth. I have a 27 mid-2011 (EMC 2429). I will not need SSOP/TSSOP/MSOP8P to DIP8P because as I can see in ifixit (https://es.ifixit.com/Guide/iMac+Intel+27-Inch+EMC+2429+Bluetooth+Board+Replacement/7553), I can connect the old BT connector to the D+/D- plus a little mod (wire R1 to the Vcc of old BT connector). Sure, if you are willing to cut off your old Bluetooth connector. I went through all the trouble so it is fully reversible if things don't go as planned. I still have a few months left in Apple care and I can return to shop for fixing. It also have added benefit that all solder is done separately before opening the Mac, which is easier to do for me. But if you want to buy a PCB board, schmartboard is a better choice if you can find them. My mounting board pin spacing was slightly too wide (1.27mm). I just made a successful upgrade of the WiFi/BL card for activating Continuity. And that's because of you guys, in this tread! So thank you. I will add some pictures of the installation. !Note: the 12 inch antenna cabe is just not long enough, so you will have to buy 2, and solder them together, or like I did, tape them together with some Electrical Insulation Tape. Make sure you cut off the right end. The adapter card can be screwed into place, but in this case you cannot do this as the antenna connection lives there. Again, use some tape to hold it in place. The Wireless card however can be screwed to the adapter with provided screws. 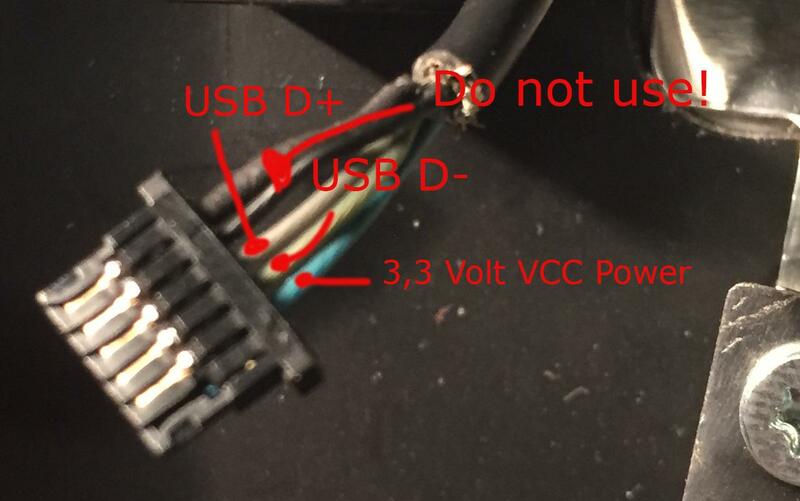 I used a USB extension cable between the bluetooth connector cable and the adapter card for D+, D- and VCC 3,3 volt power. I've cut both ends off and soldered 3 of the 4 cables to the bluetooth connector cables. I used some tape to protect the connections. After I soldered VCC Power to the adapter card and D+, D- to the cable that connects to the card, I installed it into place. I got a rev 3 of the adapter card. Next I connected the WiFi antennas to the wireless card and installed it in place in the adapter card. I taped it securely. After I booted my machine back up, I was able to move my mouse and my WiFi automatically connected to my home network. No need for repairing. Only Continuity was not activated, even when running the Activation tool. I singed out and in several times from iCloud on both Mac and my iPhone 6, and suddenly, it worked. You have to be patient. Continuity is now working for 24 hours, and no issues at all. Hope this helped for you guys! Edit -> Everything worked right out of the box, but not on the way I expected it to be. Previously, I bought a USB Bluetooth dongle to make continuity work. But that didn't work so I made this upgrade. As I booted my iMac up after the upgrade, the dongle was still plugged in, and bluetooth was working via the dongle, and not via the integrated wireless card. I can see bluetooth is recognized in the system, but I can not find BL devices. Soldering work was done good I guess. I think the issue is the taped BL antenna. So this could mean if you just install the wireless card via the adapter in the provided slot in the iMac, without any modifications (soldering), you should be good to go if you use for example a $10 USB BL dongle. I plugged in mine at the USB port on my keyboard. So this means you don't have to cut the BL connector off. I have another question to the experts Does it fit the dupont connector (down image) in the connector attached to the bluetooth module (up image)? I want to made a reversible mod as coolmaster but with only one soldering (feeding power to v3 adapter) and in a cheaper way. I wan to know if it is possible to replace SSOP/TSSOP/MSOP8P to DIP8P + bluetooth connector by 3 dupont connectors. As for longer cable for the antenna, I contacted this seller and they will make to order. I ordered 45cm lengths and they charged $5 thereabouts. The dupont connector will not fit to the bluetooth connector. Nice to hear it worked out for you. I did not run any Activation tools at all after boot up. I think sign on and sign off of iCloud did the trick. Where is connected (in the motherboard) the cable of the native bluetooth module? Is it easy to reach?